The next time you're in Amsterdam, follow the crowds of tourists (non-Dutch-speakers) from Amsterdam Central Station to the Damrak—a wide boulevard lined with souvenir shops that culminates at Dam Square. This city square, known as "The Dam," also marks the endpoint of other well-traveled streets like Nieuwendijk, Kalverstraat, and Damstraat. 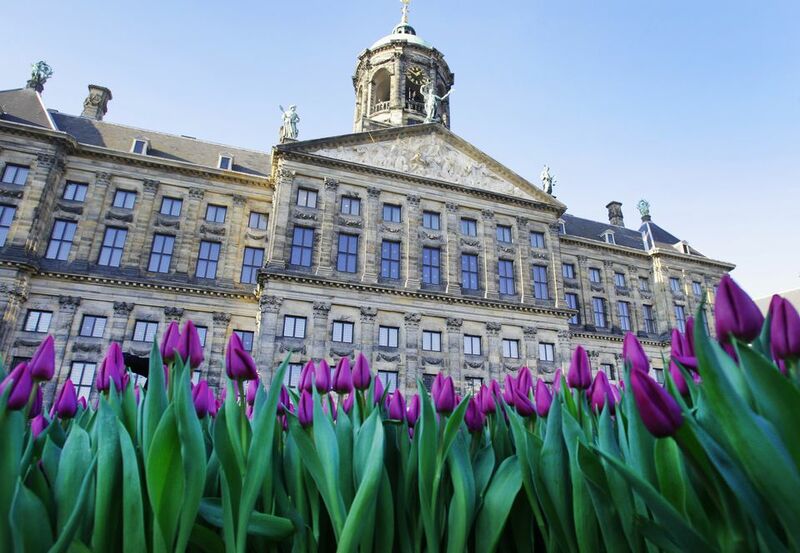 Dam Square is the triumphal checkpoint of countless visitors to Amsterdam and an ideal first stop punctuated by local attractions like the National Monument, the Royal Palace, the fifteenth-century "New Church," and De Bijenkorf for shopping. Rising out of the eastern side of Dam Square is a 1956 limestone obelisk known as Amsterdam's National Monument. It serves as the site of a yearly ceremony observed on May 4 (Dutch Memorial Day) remembering World War II and Dutch fallen soldiers. And this work of art is a site to see, as the main pillar consists of four chained male figures, two male sculptures representing members of the Dutch resistance, weeping dogs, and a depiction of a woman with a child and doves flying above. Viewing the monument is free. And if you're there in May, don't miss the Remembrance Day ceremony, complete with lectures by a celebrated author. Enlist an electric boat to take you on a tour of Amsterdam's famous canals. While on board, learn about the history of the intricate network of waterways, while kicking back with any libations you bring along. In the winter, outfits like Those Dam Boat Guys offered covered boats with heaters to make the float enjoyable. This laidback cruise meets at Cafe Wester near the Anne Frank house. Check out the "homework" on their site before you go. One of King Willem-Alexander 's three Netherlands residences, the Royal Palace on the Dam (Koninklijk Paleis) is the most historic, the most opulent, and for these reasons, the most visited of them all. The original structure was built as a town hall in the seventeenth century and modeled after Roman administrative palaces. The balcony of the palace has historical significance as the introductory place of Queen Beatrix in 1980, and then the consummatory location where Prince Willem-Alexander and Princess Máxima kissed in view of the public to seal their marriage in 2002. After a substantial renovation from 2005 to 2009, the palace re-opened for visitors to tour revolving exhibitions. The Gothic beauty that stands next to the Royal Palace is the fifteenth-century New Church (Nieuwe Kerk), built to alleviate the overpopulation of the Old Church (Oude Kerk). Services have since ceased and now the church acts as an exhibition space for high-profile art exhibits and organ recitals. The space is also used for Dutch royal investiture ceremonies and royal weddings. Take a guided tour (available in 10 languages) to uncover the historical significance of the ancient architecture. In a class of its own on Dam Square is De Bijenkorf ("The Beehive"), one of the Netherlands' premier department stores. Founded in 1870, it expanded from a modest storefront on a narrow street to its current, monumental home on the corner of Damrak and Dam Square. The store carries designer brands of men's, women's, and children's fashion and shoes, as well as cosmetics, accessories, toys, and homeware. Bijenkorf is a must-visit for avid shoppers. And even reluctant goers will appreciate a quick visit. Non-shoppers can hang out in the store's coffee shop, too. The Netherlands' own wax statue museum borders Dam Square and provides a fantastic view of the city from its upper-floor windows. Founded in 1970, the museum was the first of its kind to open in Europe after Britain's flagship debut. This effortless introduction to Dutch pop culture makes an excellent stop for families with kids. Check out wax statues of Queen Beatrix and DJ Tiesto, as well as those of Lady Gaga and Barack Obama. When night falls, adults only can head to the northeast corner of the square to stroll Amsterdam's famous red-light district. Here you'll be among crowds of bachelors, bachelorettes, and cruise-ship passengers googling over the window entertainment. Watch as college boys haggle with scantily-clad women—a true testament to the legality of prostitution in the Netherlands. If you're not there in search of services, book a tour guided by former red-light ladies and get the inside scoop on the industry. Many visitors go to Amsterdam to partake in their loose laws surrounding marijuana. And this city's "coffeeshops" (aka, "cannabis clubs") are world renowned. At Dampkring, Amsterdam's original and most famous coffeeshop, newcomers can feel welcome by their unintimidating vibe. The spacious feel, warm customer service, and the melting pot of customers—from tourists to locals and artists to business people—make any first-timer feel like they've walked into their own neighborhood bar.